In the severe type of asthma referred to as cough-variant asthma, a dry, severe and non-productive cough is the dominant symptom. Non-productive coughing does not relieve the respiratory tract of mucus. Cough-variant asthma is sometimes labelled as chronic cough due to the fact that the cough has usually persisted on lasting longer than six to eight weeks. It is common for people suffering from cough-variant asthma, or CVA, not to display any of what are considered the classic asthma symptoms, such as shortness of breath or wheezing. Most likely it is due to this lack of other symptoms that cough-variant asthma is vastly under-diagnosed and therefore vastly undertreated. Typical triggers that set off a bout with cough-variant asthma are usually exercise and respiratory infections Other diseases and afflictions can also bring about a cough, such as chronic rhinitis, postnasal drip, sinusitis, and gastroesophageal reflux disease (GERD or heartburn). Asthma is a frequent and often serious cause of cough for people today. Coughing due to the addition of sinusitis to asthma is also common. 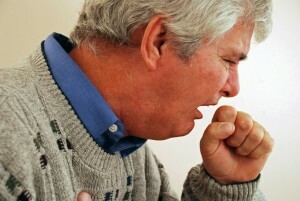 The occurrence of coughing with asthmacan take place during either the day or at night. Nighttime asthma can interrupt sleep. Another type of asthma similar to cough-variant asthma is called exercise-induced asthma. People suffering from cough-variant asthma will often notice that their coughing becomes intensified with exercise. An increase in coughing may also come when the sufferers are exposed to common asthma triggers or allergy-causing substances like strong fragrances, dust or when they are outside in cold air. Another nasty, unfortunate fact about cough-variant asthma is that anyone of any age group can pick up cough-variant asthma at any time. However, it is most common in young kids afflicted with asthma in their childhood. If a person experiences a cough shortly after he or she has begun taking beta-blockers it is most likely to be cough-variant asthma. Beta-blockers are drugs used in the treatment of migraines, heart disease, heart failure, high blood pressure, heart palpitations. Beta-blockers can also be found in eye drops used to battle glaucoma. These eye drops can bring on asthma signs and symptoms, including a severe cough. 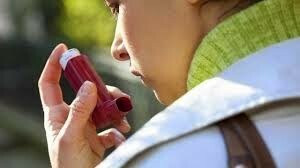 People who suffer from asthma and aspirin-sensitivity might also experience the onset of coughing with asthma. Treatment for cough-variant asthma is the same as other types of asthma. The patient might be given an asthma inhaler with drugs such as albuterol, ipratropium, and/or anti-inflammatory agents such as inhaled steroids. 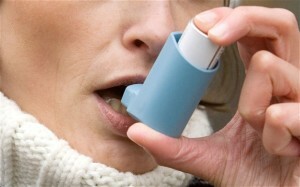 A gradual improvement in asthma symptoms should become noticeable over a period of six to eight weeks. Any time a person experiences a persistent cough, regardless of whether or not they think it might be related to asthma symptoms, a physician should be contacted. He or she might choose to order special tests, such as lung function tests, which are specifically designed for the detection of asthma to find out just how well or poorly the cough sufferer’s lungs are working. The doctor might also recommend that the patient see a lung specialist for further tests before he or she makes an asthmadiagnosis. Severe asthma sufferers might possibly be thought to have been dealt an unhappy, debilitating and overly medicated hand in life. However, he or she can live just as normal a life as anyone else if he or she gets the correct diagnosis by a trained physician, followed by receiving the most effective medication.